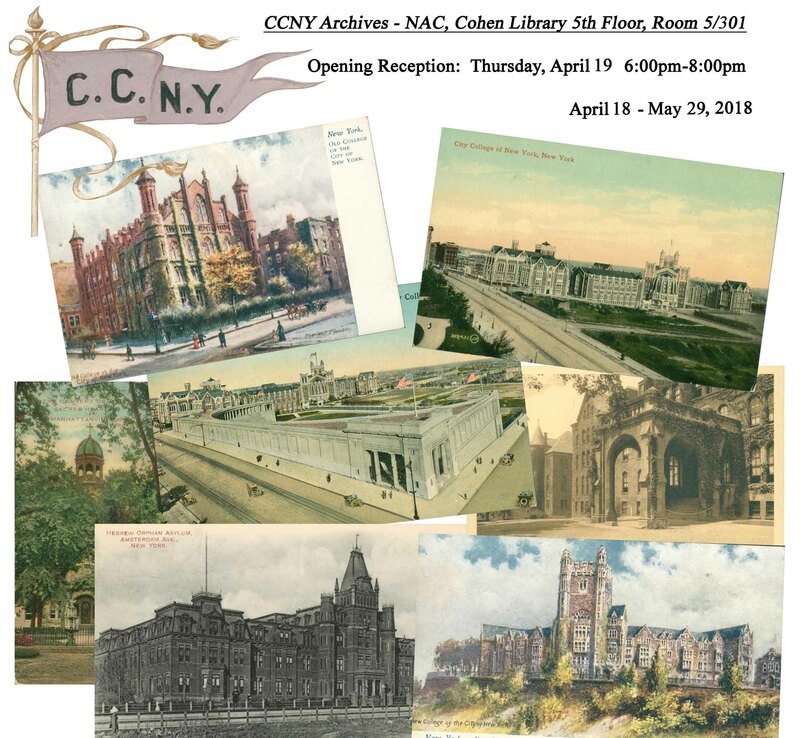 Starting Wednesday, April 18 through May 29, 2018, the City College Archives at The City College of New York will exhibit more than 120 historic postcards collected by Dalton Whiteside, a CCNY architecture student, Certified CCNY Architectural/Historical Tour Guide and Archives Research Assistant at City College. Additional postcards from The City College Archives collection of CCNY’s buildings and grounds will be on view. Postcards of neighboring institutional buildings acquired by City College such as the Hebrew Orphan Asylum and Manhattanville College of the Sacred Heart will be included in the exhibition. Also featured will be City College memorabilia such as silk pieces illustrated with college scenes and leather CCNY embossed pennants. The exhibit’s co-curators, Sydney Van Nort Professor and College Archivist and Mr. Whiteside, will provide an introduction to the materials during an opening reception on April 18 from 6-8pm. An interactive stereoscope experience (think virtual reality of the 1800s) and catering by Clove Restaurant will also be included. The exhibition, which is free and open to the public is located in the Cohen Library, Room 5/301 of the North Academic Center of CCNY at 160 Convent Avenue. For more information, please call at (212) 650-7609.